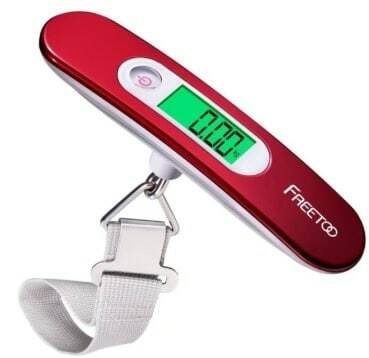 This is our review of the Freetoo Luggage scale. Its easy to carry around, and really useful if you’re travelling somewhere far far away. In Sri Lanka we wanted to buy a lot of paintings, a couple of statues, shoes, clothes – lets just say we got a bit carried away. Naturally this added weight to our luggage on our return leg so having the Freetoo Luggage scale with us really helped. We’ve been caught out a couple of times for being overweight (the luggage not us,ha) and we’ve tried to take sensible measures, however so far this scale has been effective for us. Any way the product description is below. Cons – Although we have found it to be hard wearing, some reviews suggest otherwise, generally though as long as you don’t throw it around or stamp on it we think it’ll serve you well. Ours is still going strong. Here are some extra points on the weighing scale. Why buy a portable weighing scale? Peace of mind. Luggage weight can be a burden on any one and with increased pressure on airlines to minimise costs, the pressure is inevitably passed on the consumer via things like luggage allowances to help them cut down on freight loads etc. All of these are bad choices, especially when you’re just about to board your flight. It’s better to be prepared. Why the Free too luggage Scale? If you’re travelling from the UK it can measure in kgs which is obviously useful but also can switch to other units too. It’s lightweight so doesn’t add much to your journey. It turns it’s self off to preserve battery power which is always good. It’s only £7.99 so it doesn’t exactly break the bank. The choice is yours and whether you buy this product or not we would recommend you buying a scale of some sort as it’s just good sense. Great information on the scale game! I know this is something that I always worry about when me and my wife are flying. I am quite the light packer, but when it comes to my wife…well lets just say this may come in very handy! Thanks for the review, it was very insightful! I absolutely use a luggage scale when I travel! It helps to make sure I’m not over the weight limit. It’s frustrating, though, because I have to decide what not to bring!! The luggage scale I use works, but I always have to weigh it a few times, because it’s not totally accurate. I’ve been thinking about getting another one and this one looks interesting. Do you know if it’s sold in the U.S.? Could you explains how to use it? It looks like you might take the strap and put it through the luggage handle. Is that right?